Located on the north shore of the island of Cuba in the sector called the King’s Gardens, Cayo Cruz/Cayo Romano is an exceptional fishing area composed of flats, lagoons and virgin estuaries. Commercial fishing in this zone is strictly forbidden and this is rigorously enforced by the Cuban government. The zone designated for sport fish only is 366 km2 , which means that on an average day each skiff has 50 km2 to itself. The fishing area is virtually untouched and is one of the cleanest and most biologically diversified ecosystems we have ever fished. That is one of the reasons for our choice. Aggressive fish abound as the site has had no pressure from fishing. The Republic of Cuba is an archipelago in the Caribbean. The main island is 1260 km long and 191 km wide at its broadest point. The flats and their white sand are very similar to Los Roques (Venezuela) in terms of how much is wadable. Cayo Romano is an untouched territory teaming with good-sized fish. The average size of the bonefish is 4 pounds and, in the course of the week, it is not unusual for a guest to land one or two fish around 10 pounds. What really makes this location special is that anglers can expect to catch the famous permit. There are, indeed, few places on earth where you can fish for big bonefish and, at the same time, get a shot at permit each day. What’s more, there are two places in Cayo Romano which offer good tarpon fishing. The guides tend to keep these areas for when an angler has already caught a permit and decides to try the Grand Slam. The size of tarpons varies from 30 to 90 pounds. Apart from permits, bonefish and tarpon, you can also have a shot at the other species such as the mutton snapper, snook, cubera snapper, jack crevelle, barracudas etc. The boats used in Cayo Romano/Cayo Cruz are Mitzi skiffs. Each boat has a poling platform for the guide, rod-holders and storage space at the front and back. The fishing area leaves anglers a lot of space. These skiffs are made of light fibreglass and are perfect for long distances in the shallow water flats. They are powered by 40HP Yamaha two-stroke engines. Cayo Romano is well-protected by the string of islands which shelter most of the fishing spots. Permits start to appear from mid-January. April to June is perhaps the best time to see large quantities of huge tarpon, as well as the bonefish and permit. The same can be said of July and August although these are the hottest months. You will stay at the hotel La Casona de Romano. La Casona is quite likely the most unusual fishing lodge in Cuba. 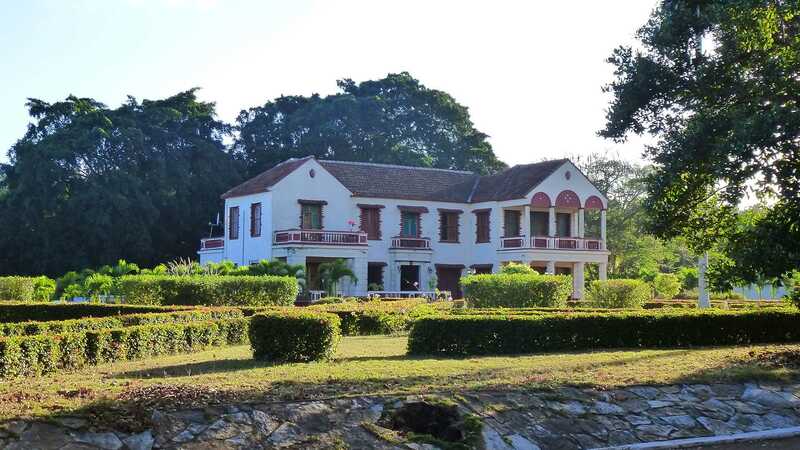 This stately home was built in 1919 by the owner of a sugar cane factory and was fully renovated 2 years ago to meet the needs of anglers. The house has 6 double and 2 single rooms. The beds in these rooms are new and, of course, very comfortable. Each room has a bathroom en suite and a small fridge for cold drinks. They also have air conditioning and a TV. The dining-room is on the first floor. The bar is just inside the main entrance and is well-stocked with rum, vodka, whisky, Spanish red and white wines as well as two brands of Cuban beer. We now offer accommodation on board a luxury yacht which maximizes fishing time without loss of time traveling ! For French citizens : for a stay of 30 days maximum a tourist visa card is required (around 30 euros, please send us a photocopy of your passport with your identity and passport number and will take care of this). Since May 1st 2010 you are required to have health insurance for any visit to Cuba. We strongly recommend you check you have such an insurance. Anyone not being able to prove so will be required to take out an insurance with a Cuban agency upon arrival in the country. Currency : Cash transactions since 8/11/2004 are in Cuban Convertible Pesos (CUC) and dollars are no longer allowed for this type of operation. Those going to Cuba should take euros and not dollars in order to avoid the 10% tax on the purchase of CUCs with dollars. Make sure you take enough money as transfers can be long and difficult. Avoid withdrawing money from ATM which give out pesos which can not be changed outside Cuba.